VMware replication is the process of creating an identical copy (aka replica) of a VM on a target ESXi host. This VM replica is a clone of a regular VM which is available in the VMware vSphere inventory. A VM replica remains in the powered off state and does not consume extra resources. You can simply power it on in case of a disaster. Natural disasters, such as earthquakes, floods, tornados, hurricanes, or typhoons. VMware replication creates copies of VMs that can be stored locally or offsite, providing the ability to almost instantly recover a damaged service from the respective VM replica. Thus, recovery times with VM replication are dramatically better, when compared to those of restoring from VM backups. NAKIVO Backup & Replication allows performing custom replication. Let’s find out how to perform VMware replication with NAKIVO Backup & Replication step by step. 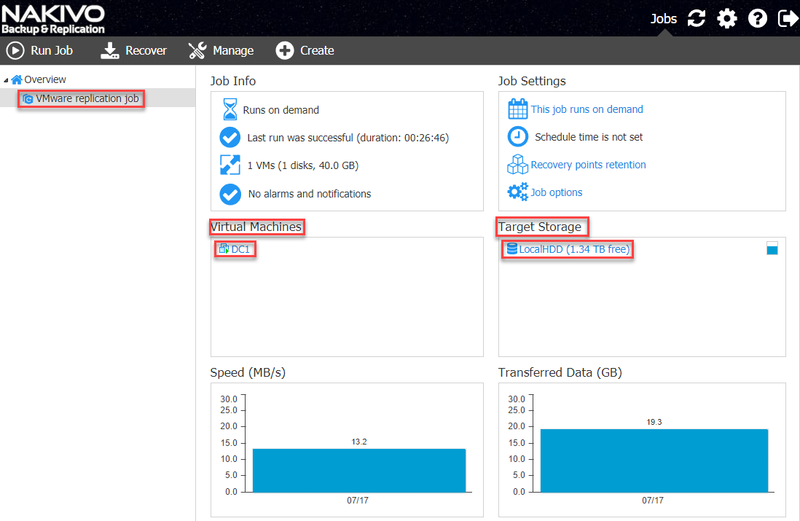 First, log in to the product’s web interface.To create a new VMware replication job, go to the Jobs dashboard. 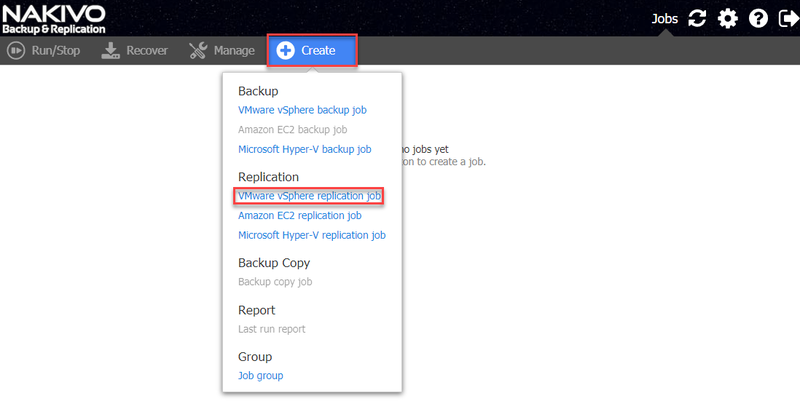 In the Create tab, find the Replication category and then choose VMware vSphere replication job. 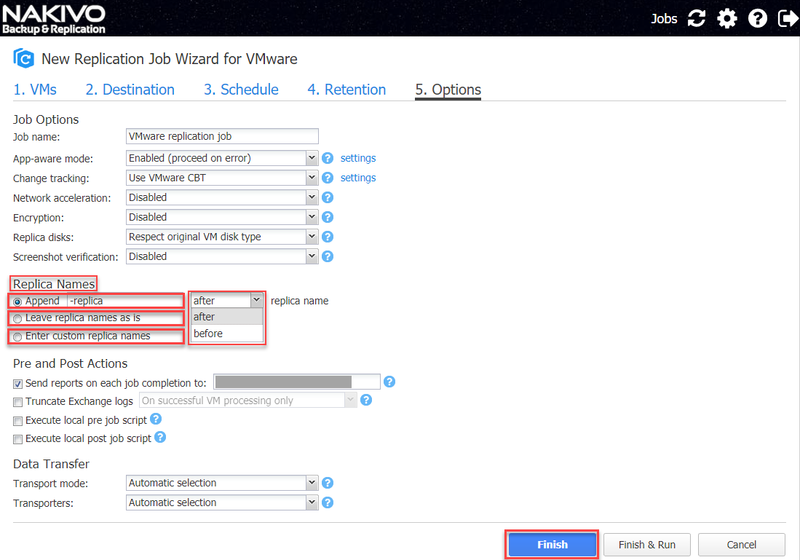 This will open the New Replication Job Wizard for VMware. 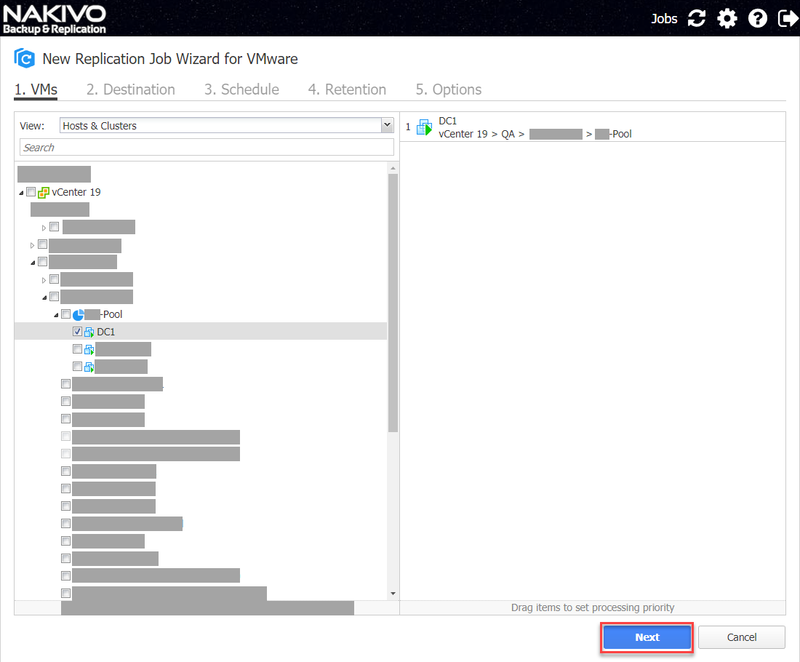 Now you need to go through all the steps of the New Replication Job Wizard for VMware. Select the VM you need from the list. Check the checkbox to the left of this VM.Click Next. NOTE: In our example, we selected the DC1 VM. This is how it looks in the vCenter inventory. When all parameters are set, click Next. At the third step of the Wizard –the Schedule –check the checkbox to the left of Do not schedule, run on demand.Click Next. At the fourth step of the Wizard, you can set up the Retention. In our case, we have chosen to leave the default retention value.Click Next. Enter custom replica names: Choosing this option, you can specify a completely new name for the replicated VM. Click Finish to finish creating the replication job and exit from the Wizard. At this step, you can test the created replication job. To do this, go to the Jobs dashboard and choose the replication job you’ve just created. In the Virtual Machines section, verify the name of the original VM, which will be replicated, and in the Target Storage section, select the target storage for the VM replica. Go to Run Job and click Run. If the replication job finishes successfully, you will see the speed of this job in the Speed (MB/s) widget and the amount of raw data transferred to the target storage in the Transferred Data (GB) widget. Let’s find out how the replica is displayed in the vCenter inventory. Go to the replica destination container in vCenter, which was specified before; you will find your replica with the name you specified. In our case, it is DC1-replica. If vCenter shows the alarm notification next to the replica’s name, you don’t need to worry. It is still the full replica (clone) of the original VM. The vCenter alarm notification means that you have identical MAC addresses for the VM replica and the original (source) VM. NAKIVO Backup & Replication provides the ability to replicate VMware VMs to minimize the risk of data loss and dramatically improve the time for recovery from a disaster. Being able to schedule the replication and set up the retention, you can always be sure that replicas of your critical VMs are their exact copies and reflect the actual state of the original VMs. You can create up to 30 recovery points for each VM replica with NAKIVO Backup and Replication. Every recovery point is a regular VM snapshot, and if the original VM has been damaged, you can easily return the VM replica back to the last known good state. Even if your primary virtual infrastructure site is down, and you are on a disaster recovery site, when the primary site is recovered you will be able to easily transfer changed data back to it with NAKIVO Backup & Replication and return the business to the normal functioning.